An ovarian cyst is a sac of fluid that grows in or on the outside of the ovary. Before menopause, ovarian cysts are very common. In fact, most women will have them at some point in their lives. However, those women who suffer from them long after their last menstruation may wonder are ovarian cysts after menopause common, and when should I be concerned? Continue reading to learn more about how common are ovarian cysts after menopause, including what the causes of ovarian cysts after menopause are and their classic symptoms. Ovarian cysts develop when a follicle fails to break open and release an egg during ovulation, and thus retain their fluid. Cysts can also happen after an egg has been released from a follicle. To be classified as an ovarian cyst, the growth must be larger than one inch (two centimeters), but cysts can grow to a wide range of sizes, including up to three inches (eight centimeters). How Common Are Ovarian Cysts after Menopause? 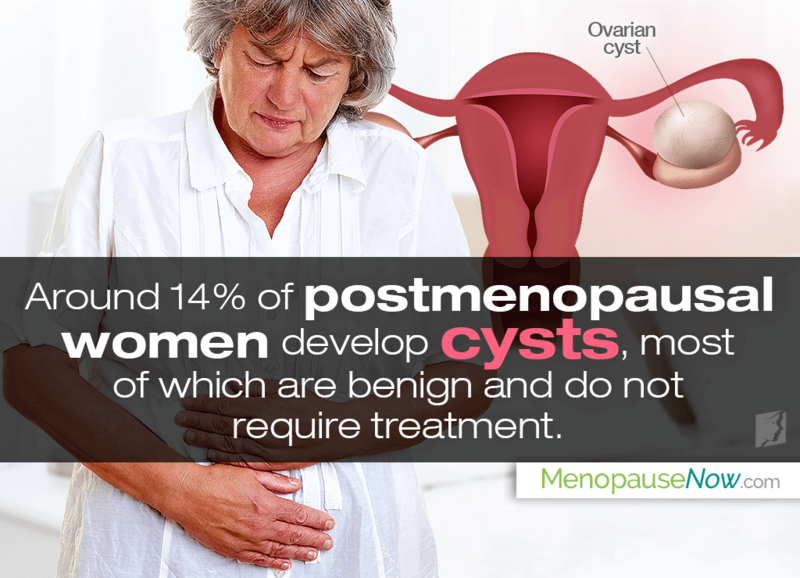 It is estimated that around 14% of postmenopausal women develop cysts. While cysts are usually benign and don't require treatment as they disappear by themselves within 8 to 12 weeks, sometimes they can cause pain or become malignant. To diagnose ovarian cysts after menopause, usually a doctor will perform an ultrasound to see their size, shape, and location. Blood tests and hormone level tests may also be done to investigate the cause and type of the cyst. Treatment options involve surgery to remove the cysts or other treatments for health conditions that may be causing them, such as polycystic ovary syndrome (PCOS). Surgery is more likely to be recommended for women who are past menopause. In this regard, it's good to recognize the symptoms of ovarian cysts in order to know when to see a doctor. Though ovarian cysts don't always cause symptoms and can disappear on their own, there are some symptoms that may indicate their presence. Although ovarian cysts are usually benign, visit your doctor regularly to get symptoms checked out, especially in postmenopause. Cysts after menopause - along with various other symptoms and conditions - can be credited to a hormonal imbalance taking place in women's bodies during the end of their fertile years. Click on the following link to learn about postmenopause treatments so that you can soar into your twilight years without many discomforts. Although this transition cannot be prevented, your quality of life is in your hands.